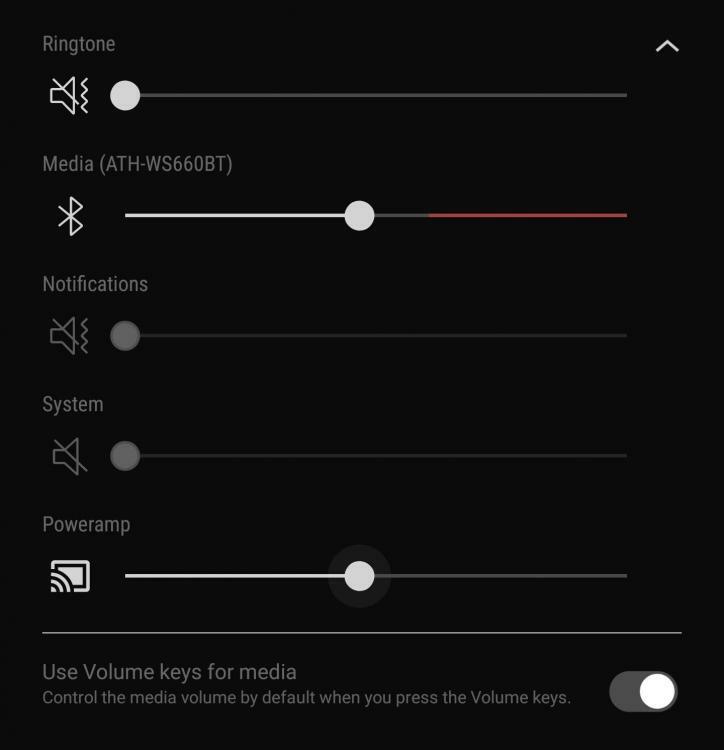 After the latest update, why is my volume control now split into two? Basically this image. Using a Bluetooth headset with Poweramp. Previously there was only one control, which was the "Media" volume. Now there's a new one called "Poweramp" below, isn't that the icon of the "Casting" function or whatever it's called? I don't have any devices I pair to cast with except my own headset. I had this too and it bothered me. I ended up clearing all of the data for Poweramp to fix it. I hope someone has a less destructive way to resolve it for you. It happened to me when I was casting to a Google Home but it still did this even with the bluetooth off or when I was away from home. After nuking it it reverted to the correct volume controls but I haven't paired it with my Home or Harman Kardon speakers again. I'll wait for legit chromecast support.